Welcome all to our annual E3 predictions show! Harrison Milfeld, Holly Fellmeth, Colin Crompton and myself (Lewis Pugh) all put on our thinking hats to guess what Nintendo may have in store for us. 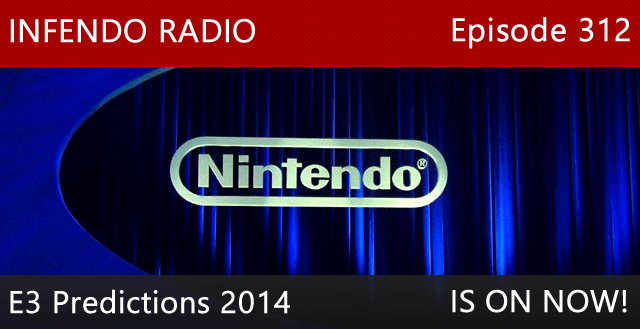 We start off the show with What we’ve been playing, including early Tomodachi Life impressions, We then cover the Nintendo News including new Smash Bros Invitational details and finally end the show with a massive 1-hour plus segment exclusively about predicting everything Nintendo has in store for us. Feel free to play along and send in your answer and who out of us you feel is more on the money before the big E3 show. Once everything has been revealed at E3, we will revisit this and see who wins this years E3 prediction game show! As always send us questions in the comments below or email to contact@Infendo.com were running low so lets get a load in for a future episode! Written by: Lewis Pugh on May 31, 2014. Infendo Radio 110 rocks out!